This graph is from the National Snow and Ice Data Center and time-lapse photography is from NASA. 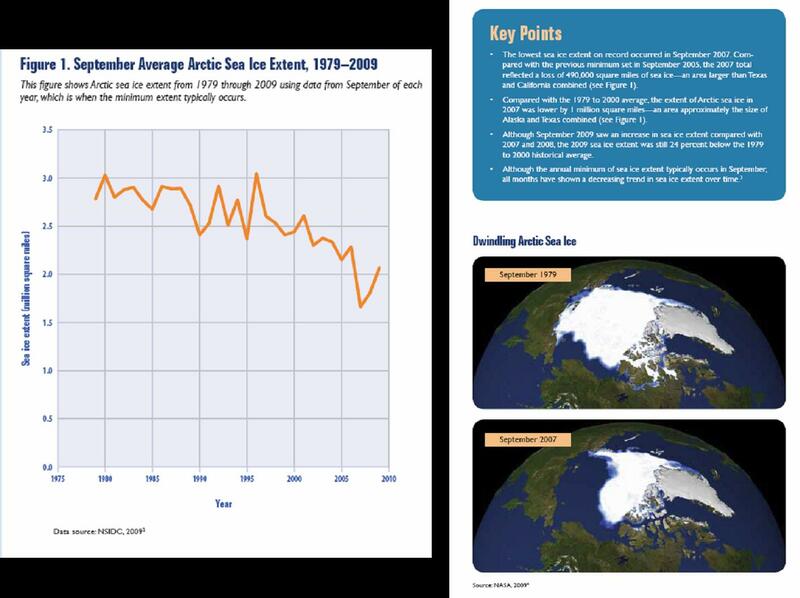 This graph can be use to answer the question, how has the Arctic ice sheet changed over time – specifically since the mid-1970s. On the y-axis of this graph is the extent of sea ice in millions of square miles (this is an area measurement). On the x-axis is time. Although there is variation from year to year the data show a clear negative trend. This decline is sea ice area is illustrated nicely with the aerial photos. The graph also provides a nice opportunity to discuss with students the difference between interannual climatic variation and climate change. Even though there is annual variation that may cause certain years to have more sea ice than others, it is the trend over multiple years and decades that reveals what is happening with climate change. 2.How might life be affected for those human communities that live at least part of the year on these ice-sheets? 3.Polar bears are often presented as the poster-child of climate change. Have students brainstorm other ways other than extinction that polar bears may cope with a changing environment (e.g. migration, hybridization).